Most people are perfectly happy with normal sized table lamps, but if you’re an overachiever, you’ll need something a little extra. Well this lamp is shaped like something that would sit nicely on an end table, but instead is much much larger. This actually may stand taller than your current end table. 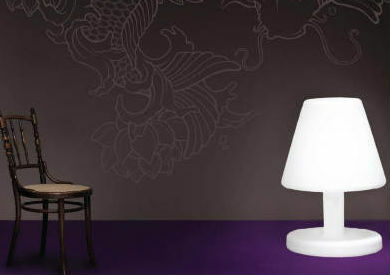 No longer will you have to rely on a normal table lamp to light the room. With this you’re bound to get a conversation going and I’m sure that price will be somewhere within that conversation. The lamp actually stands just shy of 3 feet tall. It’s not likely to provide a powerful light, instead it’s supposed to be one of those lights that puts off an atmospheric glow. In other words despite that you’ll end up paying $910, you still can’t read by this light. That seems a little harsh, they could at least make it more powerful at that price. Well at least the light will work for either indoor or outdoor use, giving you a little more flexibility as far as usage goes.